Mumbai: Shares added 0.5% on Friday despite losing some ground to profit booking, but closed the week 1.4% lower roiled mainly by investor risk aversion amid economic uncertainties sparked by Greece’s debt woes and political drama. World stocks rose on Friday, boosted by expectations that Greece will avoid a referendum on a new bailout package, easing imminent concerns of a Greek default and its potential shockwaves through the euro zone. News from Greece will again dominate next week, as markets look out for some signs of a definite settlement of the crisis. Domestic corporate earnings will also remain in focus as the world’s No. 7 steelmaker Tata Steel , aluminium maker Hindalco, top Indian real estate firm DLF and Indian Oil Corporation among others will announce quarterly earnings. The main 30-share BSE index ended the volatile session 80.68 points higher at 17,562.61, with 22 of its components closing in the green, having gained more than 1% during the day. “We have been advising our clients to take profit as the market looks overbought," said Jigar Shah, senior vice president of KIM Eng Securities. The BSE index’s 14-day relative strength index stood at 60 on Friday. A reading below 30 indicates stocks are technically oversold, while a value closer to and above 70 indicates they are overbought. “Traders tried to reduce their positions, before market opens again on Tuesday after a three-day break," said Arun Kejriwal, strategist at research firm KRIS. 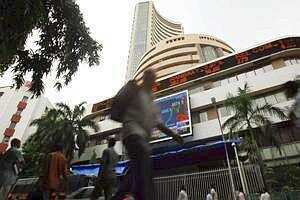 Indian markets will remain closed on Monday for a public holiday. Lenders lead the gains as investors bought battered-down stocks after better-than-expected earnings for the second quarter. The banking sector index has fallen 15% so far this year on worries that rising interest rates will hurt asset quality and margins. Top lender State Bank of India closed up 1.5% at ₹ 1,964.25, while No. 2 lender ICICI Bank , which beat street estimates this week with a 21.6% rise in second-quarter profit, added 0.8%. Non-ferrous metals maker Hindalco topped the gains as aluminum prices extended rise by 0.5%, having added 1.2% in the previous session. Sterlite Industries also gained 1.6% as LME copper prices rose by more than 1% in early trades to reclaim $8,000 per tonne mark. Shares of Bharti Airtel , India’s top mobile phone carrier, closed 0.99% higher, having fallen as much as 2.1%, as margins at its Africa operations improved. The firm announced a bigger-than-expected fall in quarterly profit earlier. Shares in the world’s top two-wheeler maker Hero MotoCorp closed up 2.05% on value-buying after they fell more than 6% since Monday on weak October sales numbers. Top power equipment maker Bharat Heavy Electricals ended up 1.47% after media reports said the government was mulling slapping a 14% import tax on Chinese power equipment. The 50-share NSE index rose 0.35% at 5,284.20 points. In the broader market, gainers outnumbered losers in the ratio of 1.5:1 on total volume of about 558.6 million shares. The MSCI’s broadest index of Asia-Pacific shares outside Japan was up 2.9%, while S&P 500 futures traded in Asia shed 0.18%. State-run oil explorer ONGC closed 0.4% lower ahead of its fiscal second-quarter earnings, which a Reuters poll showed are expected to rise 21% to 65.1 billion rupees. Bank of India shares closed 2.2% higher after it said its board would meet to consider raising equity share capital.